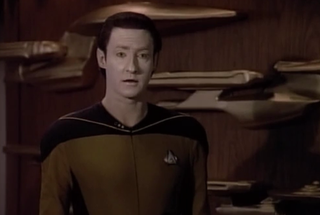 Whether dismantling his own evil twin or making the whole bridge vaguely uncomfortable with his first laugh, Data was the Federation's very own android with a human side. But just how would Data have become a citizen of the Federation in the first place? A writer for Star Trek TNG explains. Fascinating article. I really enjoyed reading it. The Measure of a Man was the Dred Scott decision set against the Star Trek universe, and I never reached the issue of citizenship. After reading the article I found myself considering the question in the context of the Federation, and I saw two potential solutions for the granting of citizenship. One would be an expansion of the "natural born" language. One could argue that if Data's creator/builder Noonien Soong was a Federation citizen then Data would also be a citizen by reason of "birth". The other option is that Data's military service would grant him citizenship after a certain period of time had elapsed. This is a bit akin to the question of whether the Constitution follows the flag. Thanks for raising questions that let me go back to playing in the Star Trek universe.